A mottled duck (A. fulvigula fulvigula) is similar in size to a mallard and possesses a sturdy body, short neck, short tail and a good-sized bill. In fact, the Florida mottled duck is often referred to as the Florida duck or the Florida mallard. The mottled duck is one of a few nonmigratory ducks in North America. These stay-at-home dabbling ducks mainly feed at the surface and are known to only dive when being pursued by a predator. Mottled ducks form pair bonds earlier in life than most other ducks. In fact, unlike most waterfowl, mottled ducks are almost never seen in large flocks and travel in pairs or small groups. A major threat to the survival of the mottled duck is the release of numerous mallards in the southeast. These feral birds interbreed with mottled ducks, diluting their wild population. Young mottled ducks are said to leave the nest shortly after hatching. Their mothers will lead them to feeding sites in water roughly 24 to 48 hours after hatching, and the young are forced to feed themselves. These juveniles are able to make short flights to escape danger at about 50 days old. They are also capable of sustained flight between 60 to 70 days. 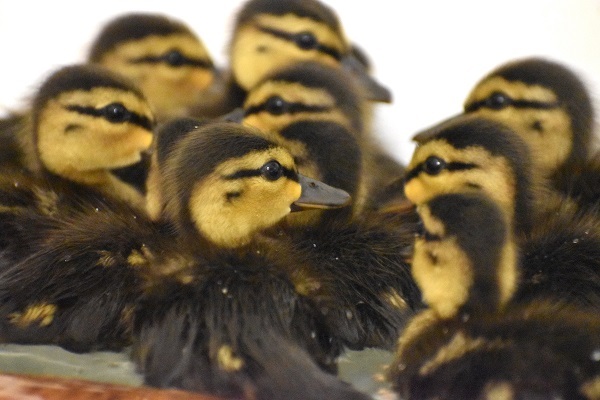 At CROW, a group of 11 mottled ducklings was admitted from Fort Myers. A female mottled duck apparently laid her eggs in a courtyard of an apartment building that contained a pool, but no other suitable water source was around. When the ducklings hatched, they were unable to escape the courtyard because it was surrounded on all four sides by an apartment building. Residents corralled the ducklings and brought them to CROW. The ducklings were all given vet checks and appeared to be in good health. An attempt to reunite the ducklings with their mother, who evidently flew out of the courtyard, was unsuccessful. As with many other orphaned/abducted wildlife this time of year, the ducklings will be raised at the wildlife hospital until they are old enough to survive on their own in the wild. 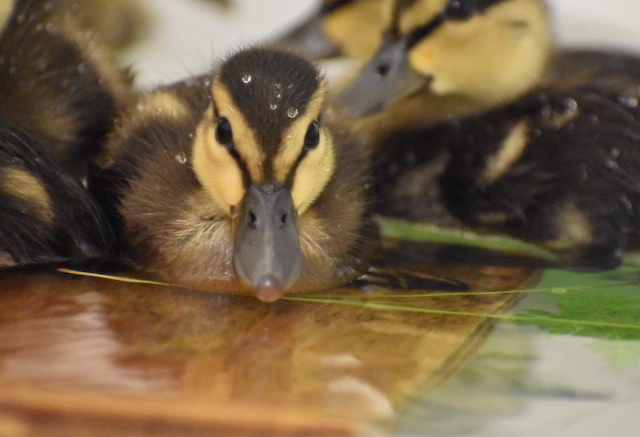 “The ducklings were less than one week old when they came to us,” said Dr. Kyle Abbott, CROW veterinary intern. “Ducklings are usually able to fend for themselves at around two to three months of age. Until the ducklings are old enough, they will remain at CROW to be cared for. “The ducklings are fed a duck chow diet that is designed for growing ducklings. It has the right balance of nutrients for their development,” said Dr. Abbott. “As they grow, the diet is transitioned to an adult duck diet. They are fed their duck chow, as well as greens, in water so that they know how to feed themselves when returned to the wild.” After a couple of months of care and feeding, the patients should be able to return to the wild.